Be the first to share your favorite memory, photo or story of Ben. This memorial page is dedicated for family, friends and future generations to celebrate the life of their loved one. 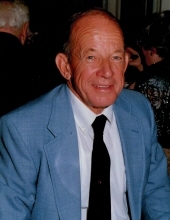 ROCKVILLE-Ben Morlan, 89, of Rockville, Indiana passed away at 5:45 am Tuesday, January 15, 2019 at Harrison’s Crossing in Terre Haute. He was employed by the Ford Motor Company from 1949-2008 serving 39 years with John Alden Sales in Rockville and 20 years with Clinton Ford. He was born July 13, 1929 in Mecca, Indiana to the late Alvin E. Morlan and Ellis Kibbe Morlan. His wife of 61 years, Lorraine Fossi Morlan whom he married September 19, 1953 in Clinton preceded him in death December 20, 2014. Survivors include one brother, Alvin Morlan of Rockville and five nieces. He was preceded in death by his sister, Marjorie Jackman on Oct. 5, 2011. He was a 1947 graduate of Mecca High School and served with the U.S. Army at Fort Campbell, Kentucky. He was a member of the Rockville Christian Church where he served as an Elder, Sunday school teacher of the Merry Service Class and chairman of the Missions committee for decades. He ministered and visited with residents at local nursing homes for many years. He was a member of Parke Masonic lodge # 8, Scottish Rite Valley of Terre Haute, Zorah Shrine of Terre Haute, German Oberlander Club of Terre Haute, American German Club of Florida, Charter member of Rockville Elk’s lodge #2471, Parke County Historical Society, Toastmasters International serving as welcome chairman and past president of Parke County Chamber of Commerce where he annually organized the Red Lehr St. Louis Levee Band concert to raise funds for the Ritz Theatre. He participated in the Parke County Covered Bridge Festival as a tour bus guide and volunteering in the Ham Shack. He was a past president and Paul Harris Fellow of the Rockville Rotary Club. He was a member of the Rockville Cemetery Board and received the Rotary Club’s David Troyer Service award for his work at the Rockville Cemetery, paving the back section and securing monuments for several unmarked graves. He was also a pheasant hunter and enjoyed running his Beagle dogs. Services will be 11:00 am Friday, January 18, at Gooch Funeral Home, 112 W. Howard Street, Rockville, with Pastor Jack E. Hopkins officiating. Burial will follow at Memory Garden Cemetery, Rockville. Visitation is from 4-7 pm Thursday at Gooch Funeral Home. Memorials should friends so desire, may be made to the Rockville Christian Church, 292 US Highway 36, Rockville, IN 47872 or Mecca A.R.A.B.S. PO Box 4, Mecca, IN 47860 in his memory. To send flowers or a remembrance gift to the family of Ben Morlan, please visit our Tribute Store. "Email Address" would like to share the life celebration of Ben Morlan. Click on the "link" to go to share a favorite memory or leave a condolence message for the family.